The New Student Induction Ceremony at Reinhardt University, a tradition in place since 2000, is truly the beginning of every incoming new student’s career as a student at this institution. Students, as well as faculty and staff, participate in this tradition every year. 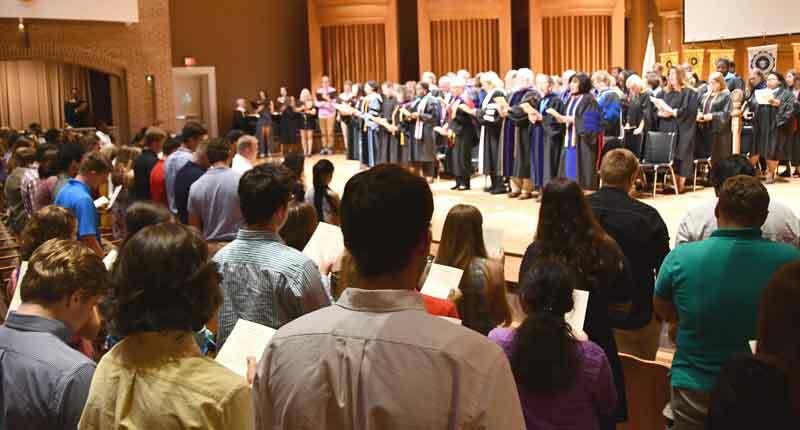 New students sing the RU Alma Mater, learn about RU traditions, and will receive a personal welcome from the President of Reinhardt, Dr. Kina Mallard, and other distinguished guests. These speakers give words of welcome, advice for a successful first year, and inspiration to Reinhardt University’s newest class. Those who attend will discover the meaning behind some of our traditional academic icons, will have an opportunity to sign the Reinhardt University Honor Pledge, most importantly, and will be inducted into the newest Reinhardt University class. The New Student Induction Ceremony will take place during Welcome Week on Thursday, August 22, at 7:30 PM in the Falany Performing Arts Center. This official University ceremony will welcome you as a member of the Class of 2023. Students should arrive no later than 7:10 PM at the Falany Performing Arts Center and will be seated according to their FYS class. Please note that this event is mandatory for all freshman students and as this is a formal ceremony, please dress appropriately. Ladies should wear dresses or suits and gentlemen should wear suits or sport-coats with a dress shirt, tie and dress shoes.